In Gear! Pan Herbal Deodorant Home | About Us | Opportunities | Sponsorships | Contact Us! As most of you know, men are far more sensitive to scent than they often lead on. Too much fragrance feels overwhelming, while a fragrance that’s too light or floral may feel too feminine. 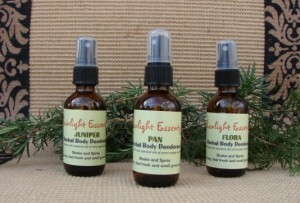 In addition to having the perfect scent in an herbal handmade deodorant, we also need it to be effective. A great deodorant smells good, works well with our own natural scent, and keeps bacteria at bay. The reason most of us wear deodorant is to avoid smelling bad. Antiperspirants block an essential function of the body and should be avoided unless directed by a doctor, but there’s nothing wrong with a little help from nature to keep yourself smelling clean all day! PAN handmade deodorant definitely excels in this area. It has an amazing essential oil based scent that lasts all day, and it works seamlessly with personal scent. In addition to the essential oils, PAN also contains witch hazel which helps keep odor causing bacteria in control while you get your work done. PAN comes in a handy spray bottle that’s easy to keep on a bathroom counter, in a gym bag, or in a glove compartment. A few shakes and a spray in the right direction puts it to work immediately. I used PAN as a deodorant and as a general body spray because in love with the fragrance and got so many compliments from it. I couldn’t be happier with how effective it is and how easy it is to use. The scent of PAN is woodsy, citrus, and clean all at the same time. 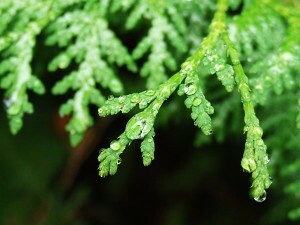 Although I am no fragrance expert, I am sensitive to smell and am picky about what I wear. I pick up notes of cedar, sandalwood, citrus, and moss – but the real combination of pure therapeutic essential oils that give this men’s handmade deodorant its scent is top secret! Many people are talking about the dangers of metals, artificial fragrance, artificial colors, and other agents used in some types of deodorants. One of the things I responded best to about PAN men’s handmade deodorant is that the ingredients are all completely natural and simple. This amazing blend is all about essential oils and witch hazel hydrosol base combined in the perfect ratio using Sunlight Essential’s proprietary essential oil fragrance blend. I love this product and have added it to my personal list of go-to grooming products for when I run out of the sample I was given. The fragrance is so amazing – I love the way it gets people’s attention because it is subtle, unique, and masculine. It doesn’t smell the exact same on two people which is a natural quality of working with essential oils since they create synergy with a person’s natural scent. The cost is absolutely amazing for the high quality of the ingredients and presentation, and the fact that we’re supporting a small business that adds TLC to every bottle is worth its weight in gold. 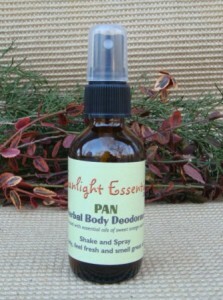 PAN Herbal Deodorant from Sunlight Essentials is a definite win for me and everyone else on the Handmade Men team! Make sure to check out the other herbal men’s deodorant and hydrosol options available from this shop including Juniper, Sage, Flora, and Thyme. They make a great all-natural and truly unique alternative to chemical-based colognes! If you didn’t catch PAN featured in the Hot Picks collection on deodorant, see it here! Tagged Body Spray, Cologne, deodorant, etsy, Herbal, in gear, PAN, review, Sunlight Essentials. Bookmark the permalink.